I had 1x3 scraps leftover from building our dining table frame and unused storage space above our petite 10 square foot refrigerator. 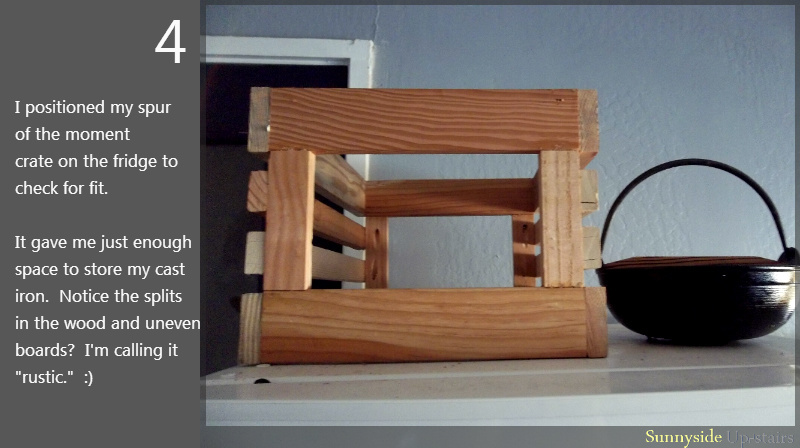 I built a storage crate based on Ana White's Chalkboard Produce Crate and Joanne's mini crate from her 1-Board Cedar Desk Accessory Set. I used old drawer pulls I saved from our previous kitchen cabinets and then, screwed both ends in crooked. I'm just talented like that, I suppose. Hah! I free-handed the word "nourish" with the same paint used on our dining chairs and console table and then I distressed it and stained over it to soften it. 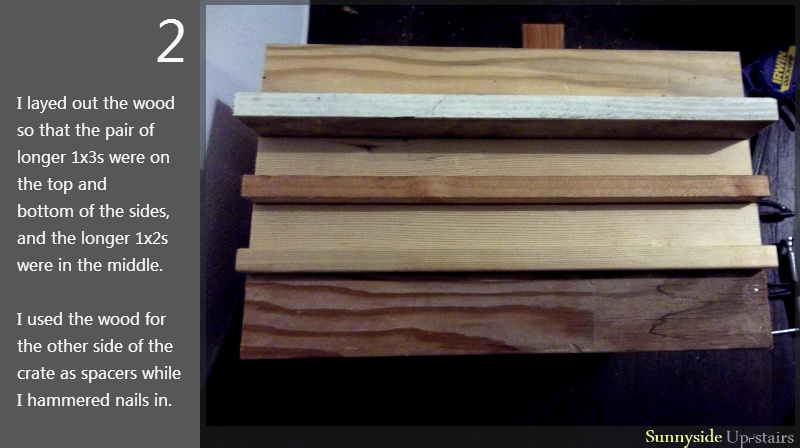 This was a scrap/leftover wood project, costing $0 using material I had on hand. 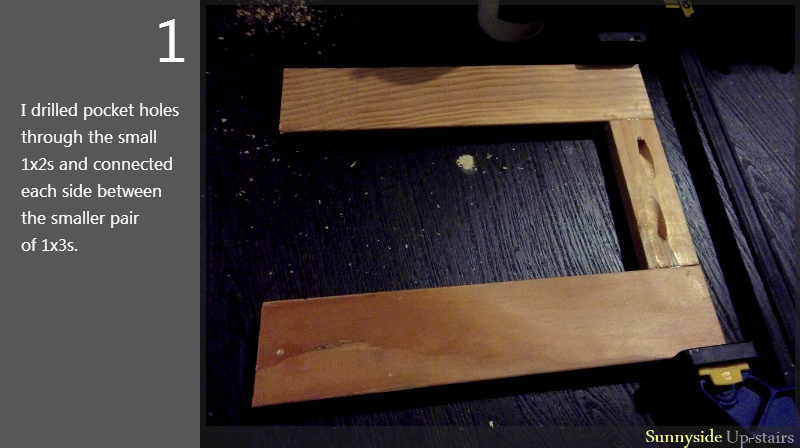 I cut leftover 1/4" plywood to fit the front and back panels as well as the bottom. I nailed the bottom in, and simply glued and staple-gunned the front and back panels in with 9/16" staples (the same ones I'm using for sofa repairs). 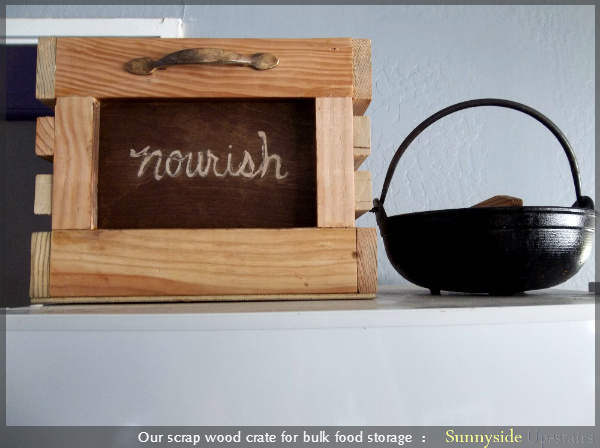 I free-handed the word "nourish" and used the blunt end of my paintbrush to rub off the dried paint from the edges of the letters. Then I lightly sanded the surface in the direction of the grain to further remove some of the paint from the exposed edges. 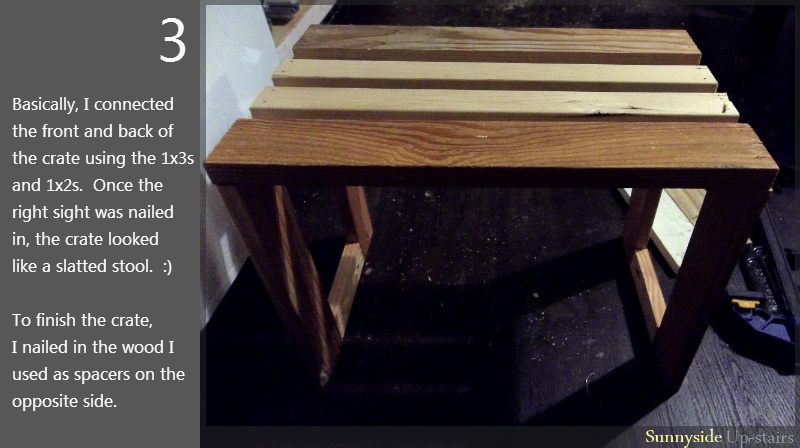 I stained over the wood twice to soften the sharpness of the paint. This is wonderful! Crates are such great storage (and cute too!) Love the painted front. Nourish is a perfect inspirational word, because in your kitchen you nourish your family, and also you nourish your readers as well, by sharing your creativity! Superb! Thank you for posting! Pretty. 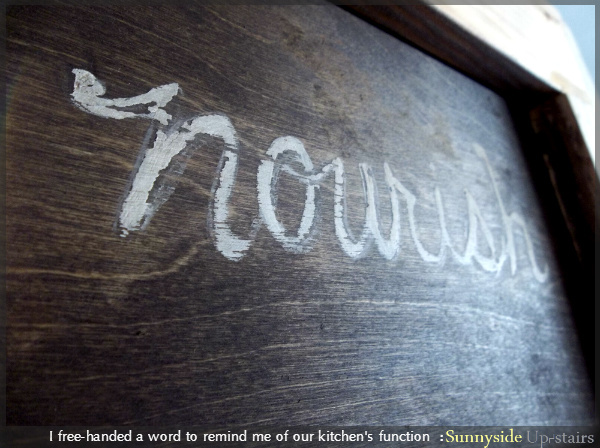 At first I thought the word “nourish” was written in chalk. I like that it is painted on instead (that way it won’t smudge!) and really like how you staining and distressed it. I can see that as a perfect place to store potatoes or onions (although my luck I’d leave one in there and completely forget about it… rotten potatoes can really make a mess of cabinet stain… don’t know how I know that *tries to look innocent*). :) Since I wanted my little reminder to be permanent, I figured I ought to paint it on. =D We store our rotten potatoes in a round basket my mom gifted us to the far right of our cooktop, next to our flour jar. I don't think I took a close-up shot of those. :) I've since learned that I can totally pass up on buying a 5 lb. bag of potatoes. Now we buy one or two hulking white potatoes/sweet potatoes every 2 weeks. Yvonne, I am in awe of your amazing skills! I need this crate. We get the bulk foods from our co-op, and this would be perfect for all of that produce. Of course, the sweet "Nourish" label is the perfect finishing touch. Yvonne, I am pinning and featuring you tomorrow! Thanks for linking up! I'm hand-making our 600 sq. ft. Hawai'i home, documenting the journey to give back inspiration I've received. (c) 2013-2014 by Yvonne Urra-Bazain. Social Media buttons by I Gotta Create. Powered by Blogger.